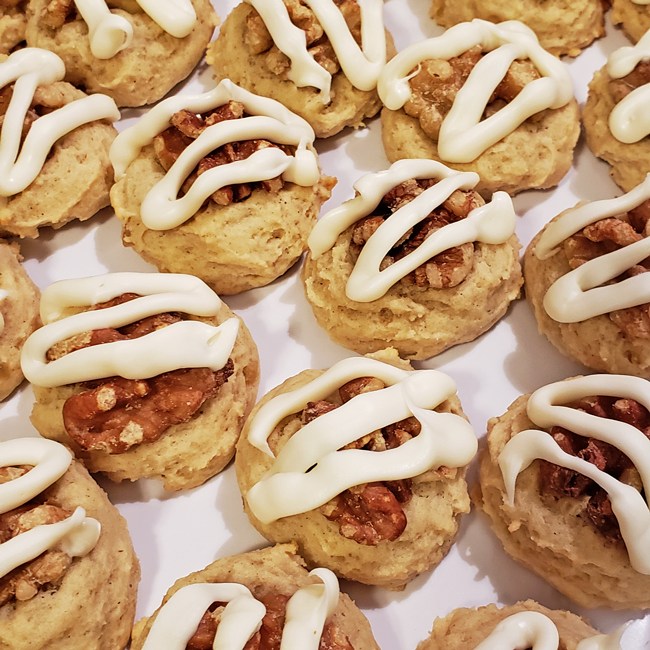 These Walnut-Topped Ginger Drops were the surprise favorite from Cookie Baking Day 2018. I chose this recipe because I like to have a good variety of cookies, or else I end up with all chocolate! I thought these were so unique with the candied ginger and cardamom. 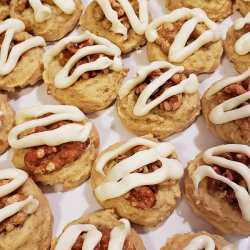 The cookies are almost cake-like and barely sweet, so the touch of vanilla chip drizzle on top is perfect. I wasn’t sure if these would appeal to everyone, but they were the #1 cookie that my coworkers talked about! What I really love about these cookies is how they are decorated. The one walnut on top with the drizzle looks so cool to me. It was hard finding whole walnut halves, but it can be done! If all you have are walnut pieces, those would look just fine on top. You could also substitute pecans or almonds for the walnuts. Another fun decorating twist is to color the vanilla baking chips. With Valentine’s Day coming up, these would be a fantastic dessert with pink drizzle! 1 - Heat oven to 375F. In large bowl, beat brown sugar and butter with electric mixer on medium speed until light and fluffy. Beat in vanilla and egg until well blended. On low speed, beat in remaining ingredients except walnuts and baking chips until well blended. 2 - On ungreased cookie sheets, drop dough by rounded teaspoonfuls 2 inches apart. Press 1 walnut half onto each cookie. 3 - Bake 6 to 9 minutes or until edges are set and light golden brown. Immediately remove from cookie sheets to cooling racks. Cool completely, about 5 minutes. 4 - Meanwhile, place baking chips in small resealable freezer plastic bag; seal bag. Microwave on High 30 to 45 seconds or until softened. Squeeze bag until mixture is smooth. (If necessary, microwave 30 seconds longer or just until all chips are melted.) Cut small tip from one bottom corner of bag. Squeeze bag to drizzle melted chips over cookies. This delicious recipe brought to you by So, How's It Taste?